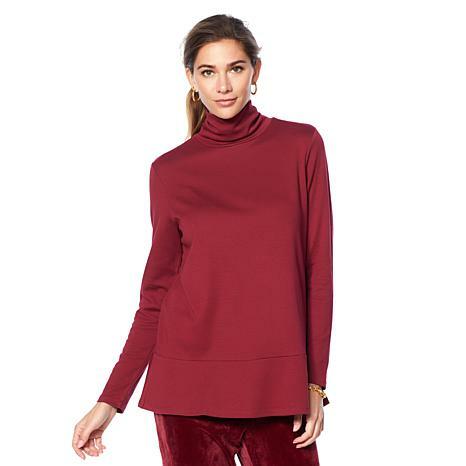 Take your downtime to new levels of style and comfort with this luxurious turtleneck top. The super-soft fabric makes relaxation even more enjoyable — and a top priority. Pair it with any lounging bottom to create a look and feel worthy of sweet dreams. 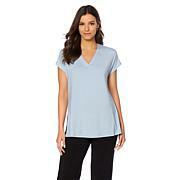 This top fits true to size and works well alone or layered. I liked the navy so much that I ordered the top in 3 more colors. The fabric is very soft and all 4 colors launder beautifully. I bought the pink one in size large. 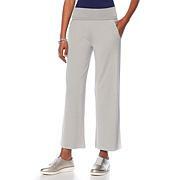 Im 5 3, measurements are 39,36,45 and it fit great and so comfortable. Laundered great too and low heat dryer. I bought 2 more that fit just the same. I dont understand the negative reviews. Maybe it looks better on someone short in stature like me. I like the slight ruffle at the bottom. At the clearance price now so Im getting another one. I wear them with DG jeans, leggings and jeggings! Comfortable. Stylish and fits as advertised. Would purchase again. Sized generous super smart design with the seamed area across bottom giving me a little slimming flair. I am a size 8/10 and bought the large. Roomy yet a great stand alone as well as layering piece. Very happy with quality.